Air filters catch all of the dust, grime, insects, sap, leaves, and any other debris that may get sucked up past the air intake of the vehicle’s grill and into the engine itself. Without the air filter, those contaminants may compromise the engine, causing corrosion and abrasion. If the air filter in the engine becomes too dirty and is not changed regularly, the engine is starved of air. Clean air filters allow just the right ratio of air to fuel to enable the engine to function properly. Engines need adequate air for the combustion process to take place. Without the proper combustion levels, vehicles cannot perform properly or efficiently and the engine may burn more gas or get fewer miles to the gallon. A dirty filter also can rob an engine of power. Drivers may notice sluggish acceleration. Air filters also can get so dirty that the engine stalls completely. But such a problem only develops after considerable neglect. Air filters may not need to be replaced at each and every oil change service call. 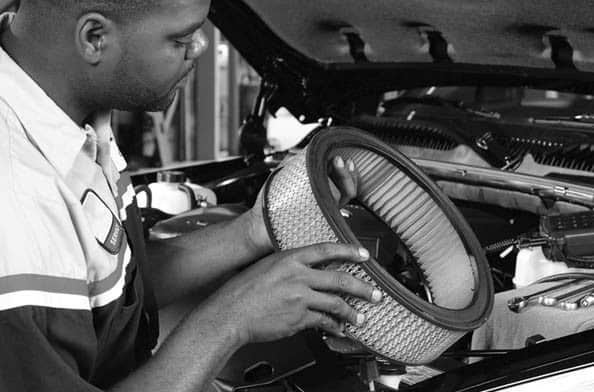 Many technicians advise replacing the filter every 8,000 miles. However, drivers who live in particularly dry and dusty regions may need to replace filters more frequently. Mechanics can often detect when an air filter needs to be replaced. If he or she notices the air filter is particularly dirty, then it’s probably time to replace it. Replacing the filter is a relatively inexpensive repair for the amount of performance and peace of mind a new filter provides.